This book was first published in 2013 in Hindi–my copy credits Maheen and Rinchin with writing down the story as they heard it from Chandrakala Jagat, and explains that it had been recreated for a film narrated by Chandrakala herself before the (Hindi) book was brought into the world. Rinchin is credited with the translation. The copy on the back of the book suggests (though it’s not very clear) that it’s based on an older folktale. What it definitely isn’t, then, is a 2016 book, so when it begins with the lines “Once not so very long ago, it so happened that all the happiness started to slowly leak out of the world” I felt, personally, rather attacked. It was all a little too real. We’re not given a reason for this state of affairs–the book seems to take for granted the fact that, sometimes, the world is full of weeping; as if this came in seasons rather than being directly attributable to a particular cause. That’s probably true. So: we’re at the mercy of an unjust and apparently moody universe; sadness comes in seasons and we don’t understand its cause; “there is nothing to eat, and there is so much sadness all around”. All familiar, along with the sense that this badness is so all pervasive and so senseless that nothing can be done about it–where does one even start, when the hostility of the world seems so large and so lacking in reason? Again, reading this on this side of the last couple of years feels significant–the (for want of a better word) mythologising of 2016 as The Worst Year, however tempting and intuitively true it currently might feel, both relies on and reinforces exactly this sense of everything awful coming out of nowhere, without reason or purpose, as well as creating the impression that there’s nothing one can do–that it’s too big and impossible and confusing and the only realistic response is to give up in defeat now or exhaustion later. Combating that feeling in the book is an elderly woman, or dukariya, who knows that some action is needed to bring happiness back to the world but doesn’t know what that action might be–until the wind brings her news of a lake behind the mountain and a fish that lives in it and that spreads happiness wherever it goes. 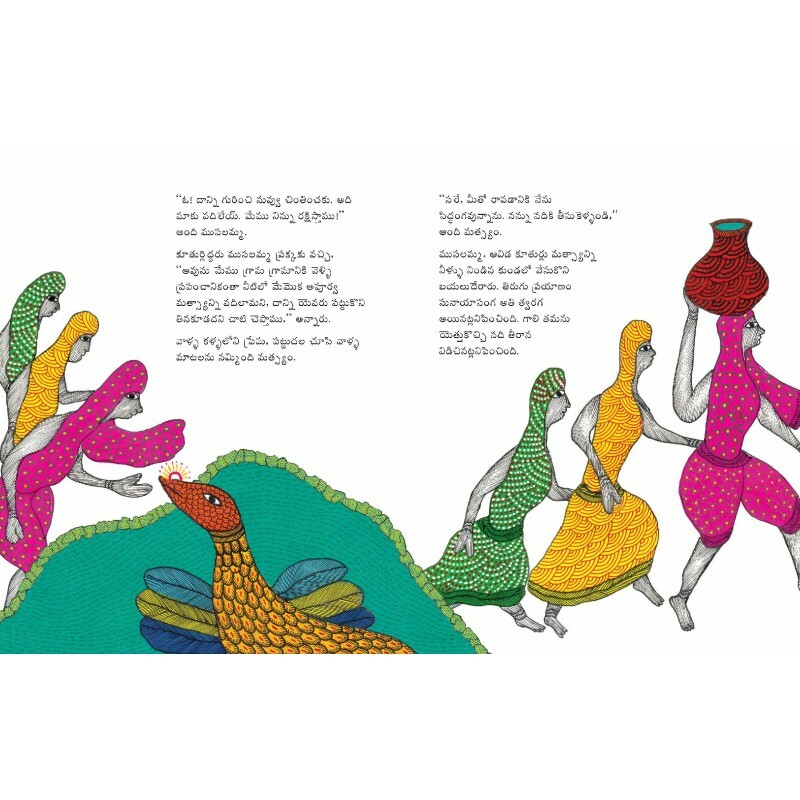 Telling her two daughters to “leave your sadness behind or carry it with you,” she takes them with her on a quest to find the fish in its green-green (I love that repeated “green” here, both as translation and for itself) lake. 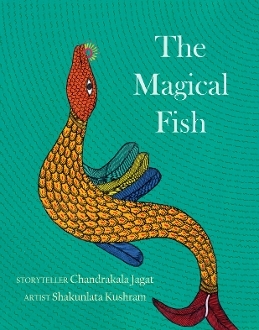 They find the fish, and convince it to leave its safe lake for the sake of a world that needs it–the fish agrees, once the women vow to do their best to protect it. That is why you must never catch the magical fish. If by mistake you do, you must let her go. And if you ever meet three women in a boat who tell you this story, you must believe them, for what they say is true. 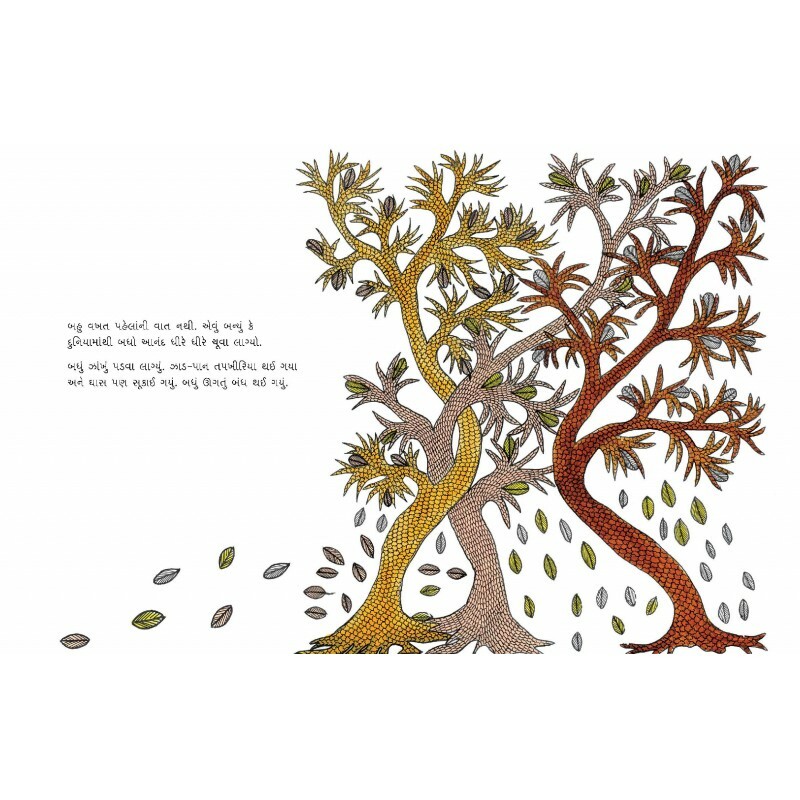 I’m aware that in reading this book in this way I’m doing it a disservice–for one thing, I haven’t even mentioned Gond artist Shakuntala Kushram’s gorgeous illustrations. But “leave your sadness behind or carry it with you” might be a great motto to carry forward into this year.